In fact, lead generation is a piece of cake. The hard part is not how to generate leads online, but how to nurture those leads so that they actually decide to buy something from your small B2B business. What should you do to generate leads if you only have a tiny budget? What part of the funnel should you focus on? Which channel is the best for you? Why is measurement crucial – especially for small businesses? During the lead generation process, the heat of your traffic will vary all the time. There will be strangers who don’t know you at all, others who may recognize your brand, and a significantly smaller group of people thinking about buying from you. Let’s take a look at each stage. In B2B marketing, the question is not whom you want to sell to (because you usually have a reasonable sense of your target market), but how you will be able to reach them and which message will work for them. People who have never met your brand before are complete strangers. Prospects have interacted with your brand, your message or your online assets at least once before. You got their attention, but they are far from being convinced that you’re unique – and they don’t know whether they want to work with you or not. They definitely need more time and persuasion. In this stage, you need ‘awareness type’ content that makes them more aware of your brand’s benefits. 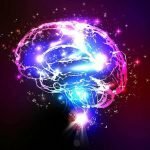 This content is more general, focusing on the main benefit of your product or service, your outstanding expertise, your unique experience and your flexible attitude. These prospects have interacted with your brand several times and they are aware of your offerings and overall brand identity. They know you and some of them might be ready to convert. In this stage, you need ‘consideration type’ content that helps them get ready to convert and contact you with further questions or ask for a quote. These pieces are more about the details, like how-tos and case studies. In many cases, these prospects are on the fence, so you need to help them get through by providing them the ‘that’s right’ feeling through their content. These people converted on your site – on a contact form, in a lead gen card, through the chat app – or they simply dialed your number. They want to know more. You’ve already gained their initial trust and they’re ready to dive more deeply with you into the details of a potential deal. That’s the group that marketers call MQLs (Marketing Qualified Leads). Cold means they don’t even remember that they filled out a contact form (it happens sometimes) or they just wanted to see the price tag for other reasons (e.g., financial planning). Leads who bought something from you. You persuaded them and they voted with their money. Now, it’s time to convert them into evangelists and advocates. It’s a common mistake among smaller companies to stop the marketing activity at the first deal. Don’t fall into this trap; each customer has the potential to become a repeat buyer (depending on your business) or a promoter. Customers who become advocates and promote your brand to others for free, only because they are satisfied. WOM (word of mouth) is still a huge marketing asset, even in 2018. 1. What if you don’t have the same amount of money as the Federal Reserve? First, most B2B companies have fewer, yet larger customers. Even if your keywords are much more expensive to target, you don’t need an army of buyers. 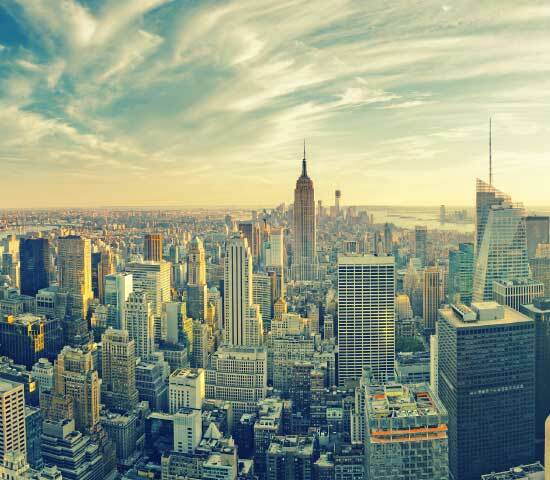 Most small and midsize B2B businesses need only a few dozen – or even fewer. Second, targeting in B2B is easy. Most B2B goods are so specific, and the right target market is so well known, that there’s little room for wasting ad dollars. Even a rookie agency can do targeting for you. That said, even if you don’t have the budget for traditional keyword targeting, you still have plenty of options to generate traffic. This is where you generate multiple high-quality content pieces, based on SEO principles, for at least 6-9 months, and you try ranking in Google to achieve massive organic traffic. It is a long-term strategy and, if done right, you’ll enjoy a constant flow of leads. b) The other option is to try paid campaigns based on the lead generation examples in my previous post. It will cost you money but you can expect immediate results, that is, as long as ice-cold leads can be viewed as results (Spoiler alert 🚨: they cannot). You’ll have to warm those up. c) There are other ways of exploiting existing platforms’ traffic by bringing a significant number of people to your landing pages from sites like Reddit, Hacker News or Product Hunt – just to mention a few of the most well-known. Unfortunately, most of these traffic bursts last only for a few days, and to be honest, I wouldn’t build a strategy on it. It’s a kind of nice-to-have extra visibility, but if your digital assets are weak, this won’t exactly make it rain. If your assets are well-optimized, the constant lead flow is coming in anyway, right? d) You can make cold calls and cold emails, of course, but we are not in the mid-2000’s… Good old interruption marketing will make you look like a dinosaur, and your ice-cold prospects will have a terrible first impression of your brand, too. 2. What should your lead gen funnel look like? Experts always debate about the ratio between the marketing and sales involvement in a lead generation process. 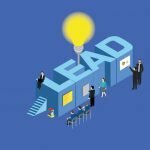 I think lead generation techniques have become a lot more sophisticated during the past ten years thanks to rapid technological developments and a mindset shift. 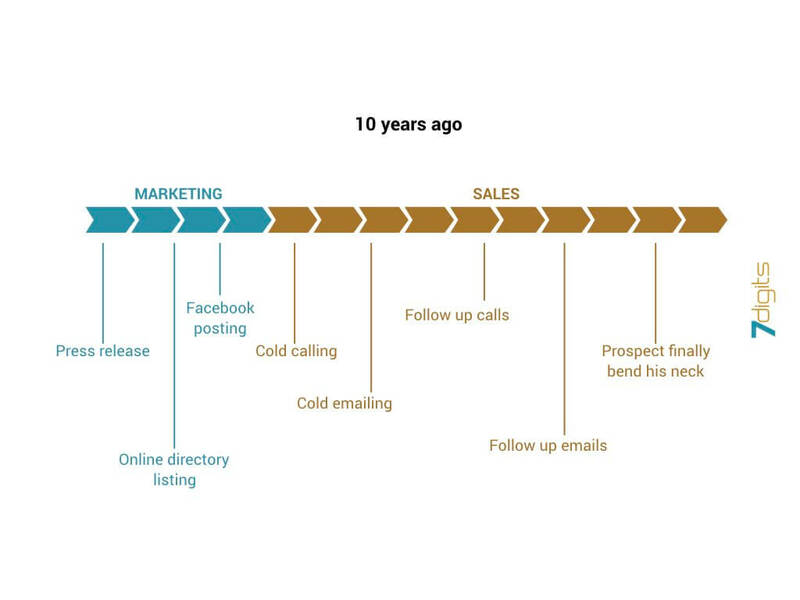 Let’s see what a lead generation funnel looked like ten years ago and what it should look like today. In current B2B marketing, you have plenty of options before contacting prospects. 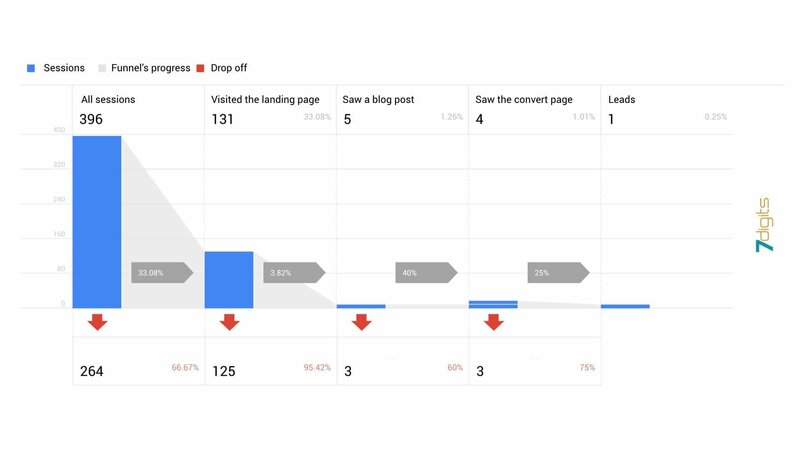 Thanks to sophisticated remarketing options and B2B strategies, around two-thirds of the whole lead gen funnel happens online without any sales involvement. No one wants to see the sales team in the early stages, and for their part, great sales people have also learned the importance of lead qualification – they don’t want to waste their time with cold prospects either. And if you do it right, after your marketing efforts, your prospects will convert on your website and they will be ready to dive into the details of a potential deal. That’s how to generate leads online, and that’s what we call inbound marketing. As you can see in the image above, you can mix marketing channels and make them strengthen each other. And with this online funnel, you can save a lot on the cost of your sales team. 3. Which marketing channel should you choose? In theory, there are endless options in B2B, but practically speaking, you have 5 channels to choose from: Google, Facebook, Linkedin, Twitter and Youtube. You need to look at your market, products, business model and skills, then choose those channel(s) that fit the best. But how do you know which one you should choose? Let’s see a super short summary. This is your first choice if your market is well-known, which means you know the search terms that your prospects are searching for. Always think in the problem-solution combo when using search ads. It’s a very special state of mind when someone is Googling something: they want something to be solved. If you can provide a relevant solution for their problem, you win. With a wide range of targeting options, the blue social giant is a good choice if you want to target cold traffic in awareness campaigns or if you are retargeting your visitor base. The extremely sophisticated remarketing options give you the opportunity to segment your prospects according to their lead temperature. Don’t try to generate cold leads on Facebook, though – people browsing this channel notorious for short attention spans while scrolling down their feed. Facebook is easier than Google to learn, but it also has its own rules and hints that take a lot of practice. It’s still cheap, but the cost of impressions get more and more expensive year by year. If you’d like to give it a try on your own, start with retargeting. If your target audience consists of multiple decision makers or people with very focused job roles, you should give Linkedin ads a try. Job roles, industries, and company names can easily be targeted on LinkedIn, which is, without a doubt, the strongest B2B social channel – and the most expensive at the same time. The ads manager dashboard is simpler than on Facebook and it has some great ad formats that will fit into your B2B marketing funnel (e.g., sponsored lead gen card, sponsored inMail). Compared to Facebook, expect to spend ten times as much. If you’re doing business in tech or media, your first choice should be Twitter. It’s astonishingly vibrant, but the noise is enormous. You have to have a well-built funnel with several steps in order to execute a winning strategy on Twitter. First, you should run highly-targeted campaigns with ‘follower targeting’, ‘keyword targeting’ or ‘event targeting.’ Then, you can use ‘tailored audience targeting,’ which is Twitter’s jargon term for remarketing. Video ads are very powerful if they are edited well. On Youtube, you have several options, from the five-second ads to longer ones. If you have the budget to produce videos, you should include Youtube in your B2B sales funnel for sure. One thing to consider though: while other social channels serve ads in a non-interruptional way, Youtube ads can be pretty annoying if done the wrong way. Be very careful with interrupting your prospects’ activity – this marketing approach is just one step more advanced than 20th-century cold-calling. Measurement should be the basis of any marketing activity. First and foremost, let’s implement Google Analytics on your site. If you’ve done that already, that’s cool, but have you set up your ‘goals’ and ‘ events’ in the Analytics dashboard? a) Connect the Search Console to your Analytics account. It will help you to see the organic search terms your website ranked for and the clicks that you received. b) Set up goals that will serve as benchmarks for your analytics. If you set up the ‘contact form send’ as a goal, you’ll be able to see which ad brings you the most leads. c) Set up your personalized funnel under the customization menu item. 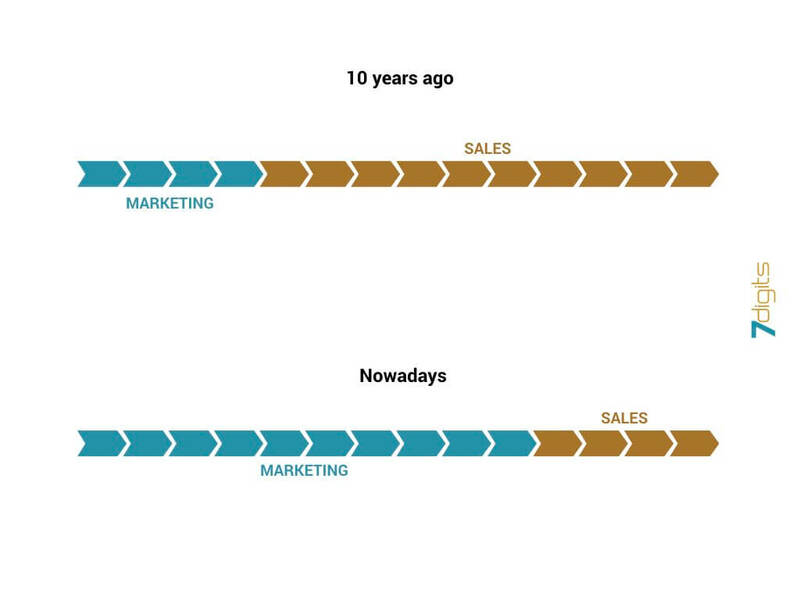 You should track every part of the funnel from the very beginning till the end. d) If you use a marketing channel, put the pixel or the code that the platform provides in order to have a 360 view of the performance (like the pixel in Facebook or Remarketing tag in Google). 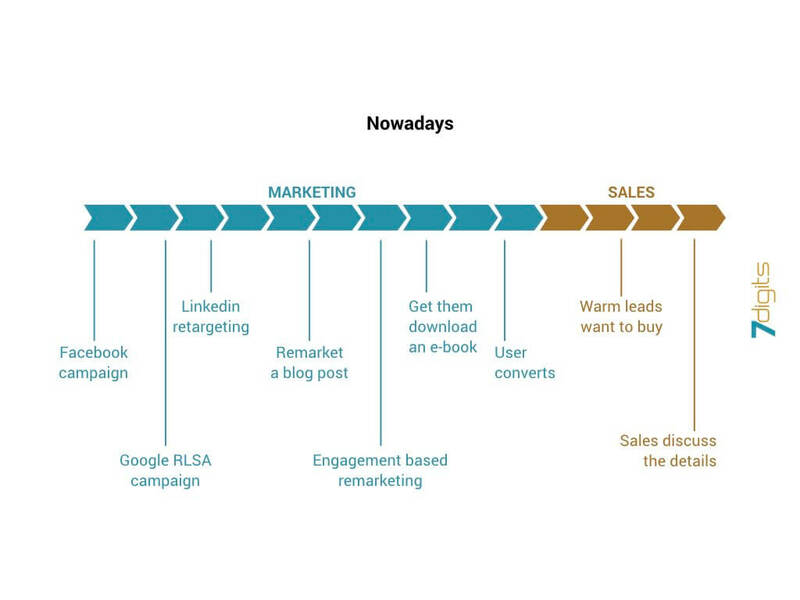 As you can see in the funnel above, there is a way to measure every step of your users’ journey. Make sure that there are no big leaks, like at stage two (95% drop off) in the example case. If you see such a high drop off rate, you know at once where to focus your marketing efforts. Lead generation requires patience and discipline. 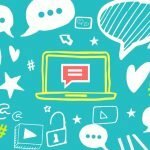 Users won’t convert at the first engagement – that’s simply not the way it works in real life, so why should it work differently online? However, with a consistent strategy and the right execution, you’ll be able to transform roughly two-thirds of your sales funnel into the digital realm and — more importantly — automate the whole thing. Good luck with your leads! Please don’t forget to click on the ‘Tricks’ menu item to see the magic. I’m here to answer any question or comment and I really appreciate every share.